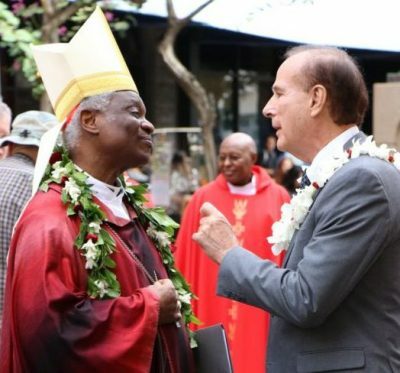 HONOLULU (CNS) — Cardinal Peter Turkson, head of the Vatican’s Dicastery for Promoting Integral Human Development, offered Hawaii’s civil servants a consecrated view of work, politics and environmental stewardship in his talk at Hawaii’s Red Mass at the Cathedral Basilica of Our Lady of Peace in Honolulu. “Good politics is at the service of peace,” said the cardinal, quoting Pope Francis’ Jan. 1 World Day of Peace message. The cardinal, who is from Ghana and is a close adviser to the pope, was the keynote speaker at the liturgy celebrated Jan. 15. The annual Red Mass is a prayer to the Holy Spirit for wisdom and guidance for Hawaii’s public servants. The name derives from the red vestments of the presiding clergy. The Red Mass corresponds with the opening of the state Legislature, which convened Jan. 16. Honolulu Bishop Larry Silva was the main celebrant. Cardinal Turkson spoke on topics addressed by his dicastery, or Vatican department. The phrase “integral human development” refers to the principles of Catholic social teaching that foster the dignity of each human person, equality among all people, and the common good of all. “A real and concrete challenge to the peace of our common home, and of the human family that inhabits this common home, is the threat in our days now of climate change and global warming,” he said. It’s a lesson repeated thousands of years later by St. Francis of Assisi, he said. “Because after all, it is when human activity is inspired by faith and charity that we end up fashioning the type of society that we all expect to live in, a society of harmony and a society of peace,” he said. The Mass this year brought together a modest number of civic leaders. According to Bishop Silva’s office, in attendance were 12 from the state Legislature, one representative of a member of the U.S. House of Representatives, one judge, two neighbor island mayors, a representative of a third neighbor island mayor, four from the City and County of Honolulu, two military officers and two members of the Office of Hawaiian Affairs. The morning Mass opened with a traditional Hawaii ‘oli,’ a chanted prayer, and the singing of the “Hawaii Ponoi,” the Hawaii state anthem. Adding a touch of pageantry to the opening procession were 25 members of various Hawaiian societies, some dressed in black, others in white, some wearing red and yellow capes. The Knights of Malta and the Knights of Columbus also joined in. Fifteen priests and seven deacons participated. Also present were leaders from other faiths. At the end of Mass, the public officials stood for a blessing, which the bishop administered as the clergy, both Catholic and of other denominations, extended their hands over them. “God of power and might, wisdom and justice, through you authority is rightly administered, laws are enacted, and judgment is decreed,” the bishop said. “May they be enabled by your powerful protection to discharge their duties with honesty and ability,” Bishop Silva said. Downes is editor of the Hawaii Catholic Herald, newspaper of the Diocese of Honolulu.